Members of various unions affiliated to the South African Federation of Trade Unions (Saftu) have started to gather in Kaizergracht street in the Cape Town CBD for their march to Parliament. The march has been planned to coincide with Finance Minister Tito Mboweni’s budget speech. In a few hours, Mboweni is set to address South Africa on the country’s budget and spending patterns. This as South Africa battles a slugging economy. Saftu is calling on Mboweni to present a people-centred budget which predominantly focuses on improving the lives of the poor. Saftu and other labour unions including the National Union of Metalworkers of South Africa (Numsa) will be marching to Parliament as they voice their concern about the state of job security and high unemployment and ongoing retrenchments in the country. Issues pertaining to the scourge of corruption in South Africa are also being highlighted during the march. General Secretary of Saftu, Zwelinzima Vavi, will be leading the march. 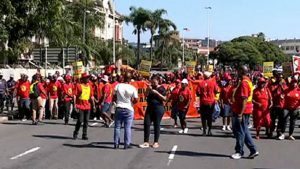 The post Saftu marches for job security ahead of budget speech appeared first on SABC News – Breaking news, special reports, world, business, sport coverage of all South African current events. Africa's news leader..